Scroll down for further information about these singing evenings or contact me. Please click here if you would like to subscribe to my email list for singing. There is a Taizé service at St Laurence Church in Stroud at 6pm on the 3rd Saturday each month (arrive at 5pm for practice if you wish). On visiting Findhorn for the first time in 2002, I came to love Taizé singing, and a chance conversation led me to start a Taizé chant group as soon as I moved to Stroud in 2005. This has gradually evolved into a group which sings or chants from a much more widely eclectic repertoire, and I have been strongly influenced by the Dances of Universal Peace, which honour all the major spiritual traditions of the world. 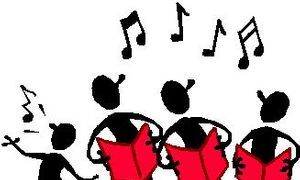 Some songs we learn by ear; for others I offer sheet music, but music-reading is not required or expected. We sing anything from unison chants to rounds to four-part harmony and many of the songs have a meditative flavour. We often enjoy an extended silence after a song, to allow ourselves space to experience the stillness and fullness of the quiet that may follow the music. Every-one is welcome - come with an open heart and share your voice with others in this sacred space! I have co-compiled a beautiful book of the songs and dances of the type we sing on Mondays - see this page. Donations invited on these singing evenings - we support a different charity every month or two. Suggested contribution £7/£5. May-June 2014 £60 Lotus Outreach www.lotusoutreach.org/education supporting education of girls in Cambodia. Mar - Aprl 2014 £98 County Community Project - Cheltenham-based charity supporting vulnerable people.